..so they dance! : Memelicious; Saif Ali Khan alphabets. Memelicious; Saif Ali Khan alphabets. For one of my favourite actors in the world of Hindi cinema, I talk about Saif quite a little. I could pretend I have no idea why that is, but honestly, I know exactly why. It's because he released Race this year (not all his fault but good god! ), it's because he seems to be only in the news to gloat about how awesome it is to date Kareena Kapoor (I love her, too, but I honestly don't care about the two of them anymore! ), it's because .. well, I guess the level of enthusiasm has dropped from "ooh, new Saif film!" to wary optimism (occasionally pessimism) about his future films. The man's never been perfect (and don't I know it) but sometimes he's a little less imperfect, you have to admit. 2006 was a terrific year to be a Saif fan, for example. But as the fun alphabet meme's been going around, Beth giving some love to Rani Mukherjee and Shweta listing Hindi noir films of the olde, I thought I'd list alphabets Saif-ly. A is for Akshay. Bet you failed to see this one coming. Yes, Akshay Kumar, current king of the box office (save Tashan for numerous reasons I could speculate, but hopefully none of them is the fact Saif and Akshay starred in the film together), the best co-star Saif can have and has had as far as I'm concerned. Don't get me wrong, he's great with a lot of other people, as well, but something about his chemistry with Akshay just gels and they both have comic timing to die for. Plus they get along great in real life. Here's hoping they do something together in the future. B is for Being Cyrus. Excellent dark comedy in English, directed by Homi Adajania. It has some parts that are a little too weird, but I adore everybody's performance in this (Simone Singh, Dimple Kapadia, Boman Irani, Naseeruddin Shah & Saif naturally - what a cast! ), and remember Saif saying in an interview it's the kind of film he enjoys the most himself. I've heard rumors the director is working on a new film that will be produced by Saif's company - let's hope it turns out to be true. C is for Cyrus or see how incredibly uninventive I am even this early in the post. 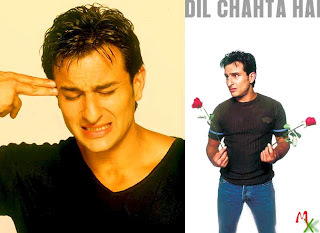 D is for Dil Chahta Hai. Predictable, I know, but what else would you place here? Saif as the hopeless Sameer is just one of his absolute funniest, effortless performances, and it's also the one that convinced a lot of people this guy should stay in movies. The friendship between the trio of guys in this film is still considered one of the most realistic, wonderful depictions of friendship in Hindi film history and it's often mentioned as changing the tone of Bollywood films and bringing them to the new millennium. Quite a lot of praise for one movie, but if you still haven't seen it, forget everything I just said and watch it for a fun time. E is for Ek Hasina Thi. If you haven't seen this movie yet, drop everything you're doing, rush to Nehaflix, your local Hindi DVD retailer and buy this film. Now. I'm 100% serious. I remember when after seeing Hum Tum (a film that showed that that guy I liked a lot in Kal Ho Naa Ho was good in other films, too, and I was beginning to consider myself a fan) I was browsing IMDb and checking out Bollywood films I potentially wanted to see, and ran into EHT. I only remember seeing the poster with the streams of blood and the tag line "It started like any other love story..." and I knew I had to get my hands on the film. It is quite simply all-around excellent, and even if it wasn't, I'd want to own it because Saif looks his absolute hottest in this film. F is for funny. Because comedy's really what appeals to me most about certain actors, and Saif is one of those actors. Even when I drag myself through his godawful (or just very very mediocre) 90's films, sometimes the script is barely good enough to allow his comic timing to surface itself. The thing is, he had it in him all along but the films he chose to do (or got offered) were mostly dreadful junk. Somewhere along the line he grew confidence and the ability to choose wiser and for that I'm glad. Nowadays the same problem persists, though: there simply aren't good enough Hindi comedies to go around. G is for gay jokes. See also: Kantabeen. See also: Filmfare 2004. See also: this clip. You know you want to. H is for Hameesha. Some people might tell you this movie is cheesy fluff. Some people might tell you this movie is adorable and stupid. Some people might tell you you'll want to see it. Some people are wrong. Hameesha ('always') is a godawful, boring, ridiculous 90's movie starring Saif and Kajol, where Saif's mullet is out of control, so much so it gets it should get its own credit, the story is some dumb crap with reincarnation, and it remains the only film where I've found Kajol's acting completely unconvincing. "Neela dupatta" may be a fun song, the fashion may be laughably bad but please don't subject yourself to this movie. Oh god please. I is for Ishwar 'Langda' Tyagi aka the role we'll hopefully remember him from in the future. A part of the appeal of Omkara is no doubt the fact that some of its cast steps outside their usual character nichés to portray something radically different. The change from the modern, super-rich, English-speaking NRI type characters to a dirty UP gangster who's most at home in the village is indeed a stark one. Roles like this don't come very often, and I'm glad Saif had this opportunity. Here's to hoping it won't be the last one! J is for jodis. Probably one of the most popular Saif jodis is Preity-Saif, here in a misleadingly adorable picture from Kya Kehna which is actually NOT a very good film, and their pairing in it is also not too romantic. Do not be fooled! K is for Karan. Karan, not for Karan Johar who put him him Kal Ho Naa Ho, but Karan as Karan Kapoor of Hum Tum and Karan Singh Rathod from Ek Hasina Thi. Two excellent but very different performances, both from 2004. Karan Kapoor is the character who grows up and matures during the movie, while Karan Singh Rathod is the character who remains the same throughout the film. Whatever change might occur in him, it's only on the surface, a mask he puts on and off as he wishes. Two of my favourite performances by him, and good films, too. L is for Love Ke Liye Kuch Bhi Karega. An underrated film, one of the few truly situtional comedies Bollywood has produced, also starring Aftab Shivdasani, Fardeen Khan and Sonali Bendre, including Johnny Lever at his funniest (yes, I said it - he is truly funny in this one). This is a predecessor to Dil Chahta Hai, but Saif's performance is up to that DCH level and so if you're running out of post-2001 Saif films to watch, rent this one. M is for "My adorable darling". The catchiest, worst Hinglish song ever, from Main Khiladi Tu Anari. Sung by Anu Malik himself! God, the horror. N is for "No Smoking". The theme is central in the episodic film Darna Mana Hai ('fear is forbidden' - should more accurately be called 'fear is impossible because the film is more funny than scary'), where Saif stars in a segment where he plays a photographer checking into a motel run by Boman Irani's character. I love it a lot, Boman and Saif are just hilarious together. O is for "Ole ole" from Yeh Dillagi. Mullet!Saif classic. Watch here. P is for Parampara. An early 1990's film with Saif and Aamir as frenemies. You might ask yourself, "why haven't I seen this?". The answer is: the universe is smart and has made sure the DVD's of it aren't that widely available. It's just not very good. Sadly it's not incredibly bad, either, so I know some of you have seen it, and some of you are googling for the DVD as I type this. Q is for "quite painful" which is the only way I can describe watching a song DVD filled with songs from Saif's crappy 90's film catalogue. You'll never see so much crotch-thrusting in your life. I had to take a shower afterwards because I just felt gross - it's like bad cinema taints your skin. R is for Rohit Patel. I remember like it was not yesterday but a day way cooler than yesterday and thus worth remembering. Me and my friend, going to the Helsinki International Film Festival to see Kal Ho Naa Ho, a film about which we knew virtually nothing except it starred Shahrukh Khan, an actor we both quite liked. But the weirdest thing happened - instead of loving Shahrukh like usually, I found I kind of preferred the other guy - the awkward Rohit who failed at love but made funny jokes and was otherwise sympathetic. He gets shafted in the movie, but I still think fondly of him. 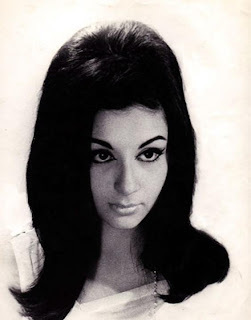 S is for Sharmila & Soha. The two gorgeous filmi women in his family; the mother and the sister. T is for Thoda Pyaar Thoda Magic. Sure, it's a cheesy children's movie, but it sure as hell beats the other Saif/Rani children's film starting with T where the worst thing EVER is when a super-rich family has to go middle class and live in an apartment (ugh can you imagine the horror!)... Needless to say, I hate the latter movie. Thoda Pyaar is quite sweet, though. U is for "unwise" which is how I would describe watching more than three song picturizations from really bad 90's Saif Ali Khan movies. V/W is for "Woh ladki hai kahan". Fantastic song and funny picturization from DCH. X is this scene in Parineeta. Y is for Yeh Dillagi, the most recommendable Saif film from the 90's (next to MKTA) and Yash Raj Films, the production house who just loooves casting Saif. Z is for zzz or congratulations whoever made it through this incredibly long post! ROTFLOL at the thought of you taking a shower after watching the songs DVD. That is too funny. Hey, I made it through the entire post, and it was fun! Except, I didn't check the youtube link; is it the wedding night scene? Cute!! Very thoughtful as well. Okay, Aamir and Saif as frenemies... why haven't I seen this. Oh, wait!! It's not worth watching! Thanks! Saif's best performances were in Being Cyrus, Ek Haseena Thi and Parineeta. Ek haseena thi - he was a bad guy. I just hated him while wathing the flick. When you start hating the bad guy, you know he is the best actor. ajnabi - Yes, it's the 'wedding' scene/song "Main hu parineeta". Sizzle. Filmi Girl - I enjoyed portions of it but some of it was so boring and bad.. plus first half consists entirely of Too Damn Old Vinod Khanna (I love him in the 70's but early 90's? no thanks!). Darshit - Yep, he was really despicable in EHT, though I think I hated his character more in Omkara. "Unwise" is exactly how I would describe watching most of his pre-DCH movies but the guy turned cute almost overnight in DCH (I found him the only memorable thing there)! Its funny what a 180 degree turn most of us (who grew up with his earlier movies) have taken about him. I remember, my sisters had a chance to go watch the shooting of Main Khiladi Tu Anari and had to be prodded by Mom to get his autograph (there was no public to watch the shooting so, it was a bit pointed to take Akshay's and not take his!) - now we all love him so! Here's hoping he'll do good roles more often. Oh My Adorable Darling is stuck in my head now. bollyviewer - Indeed, it's sometimes quite amazing what kind of a turn-around Saif's had. That's so cool about watching the MKTA shoot! Anita - Oh I preferred to Chandruchur Singh and Preity or whoever that other guy was .. but still, I didn't find it very nicely romantic. Heh. Au contraire, extremely creative. Really enjoyed reading it. Proximity awards -- the remix.